I have this beautiful, much-loved solo dress for sale. I am only selling it in order to pay for a new dress. The base fabric is black shantung with applique made from red glitter ball, silver glitter ball, black glitter ball, silver lame, silver large glitter dot, and silver holo-square with silver and red metallic embroidery thread. The underskirt is red glitter ball. 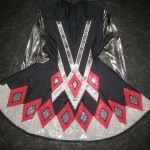 The side pleats are also lined with red glitter dot. Dressmaker is unknown as dress was received second hand. 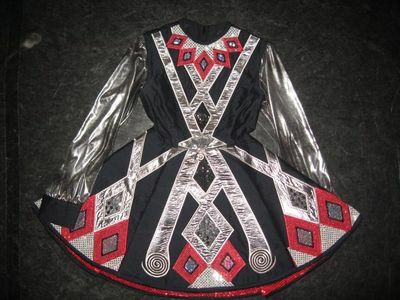 This dress would be great for novice/prizewinner or even for an adult. The skirt is stiff and hangs nicely. 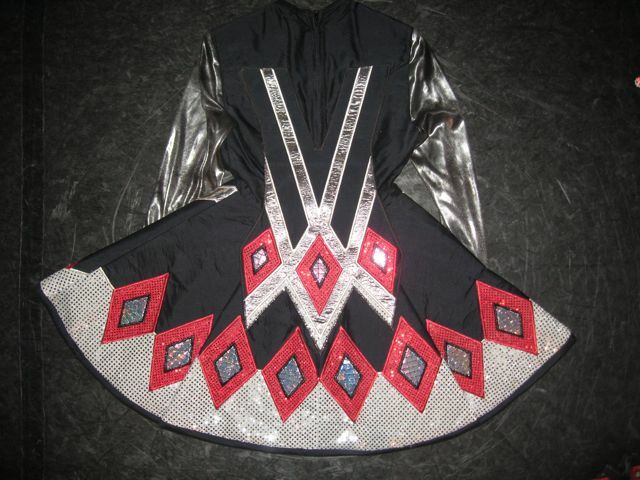 The dress is in very good condition, with only minor wear that is not visible from stage. The lame on the sleeves has some rubs/snags on it, but it is not noticeable unless you look at it up close. There are also few glitter-circles missing from the front panel applique. There is a jeweled number clip on the front, also. The cape is a stiff cape that attaches with velcro. The zipper is made of heavy duty plastic. The cuffs have a velcro closure. Included with the dress are red glitter dot kickpants (that match underskirt) and two headpieces (one embroidered, one flower headband). There is also about a yard of red glitter dot fabric that you could use to make an extra pair of bloomers or a new soft cape. I will also throw in a pair of matching red crystal earrings. If you want I will also include extra flowers and crystals (red, black, white) if you would like to make an additional flowered headband. There is about 1/2 inch of let out at the top of the shoulders. When I had the dress altered it was too long in the torso so I had them shorten it by taking it up at the shoulders and shortening it at the waist, but the fabric is still there to let it out again. However, the extra waist fabric is inside the lining so I’m not sure how much is there.